The same Waldbaums a month later, and score again! The other issue of JUSTICE LEAGUE OF AMERICA that I had missed, available to me in a 3-Bag. In this case, I still have one of the other books this came with, which will be the next book I cover. This issue has an interesting cover–I don’t know that I’ve ever seen this precise shade of green on a comic book cover since (though this shade tended to change throughout the print run, so my copy isn’t exactly like all of them.) Makes it slightly tough to read some of the cover copy, though. This was a good issue that suffered for me a bit having already read the concluding chapter, including its detailed recap. Still, I was very glad to have it, and to have filled in that hole in my collection–the very first time I had done such a thing, albeit in a very minor way. 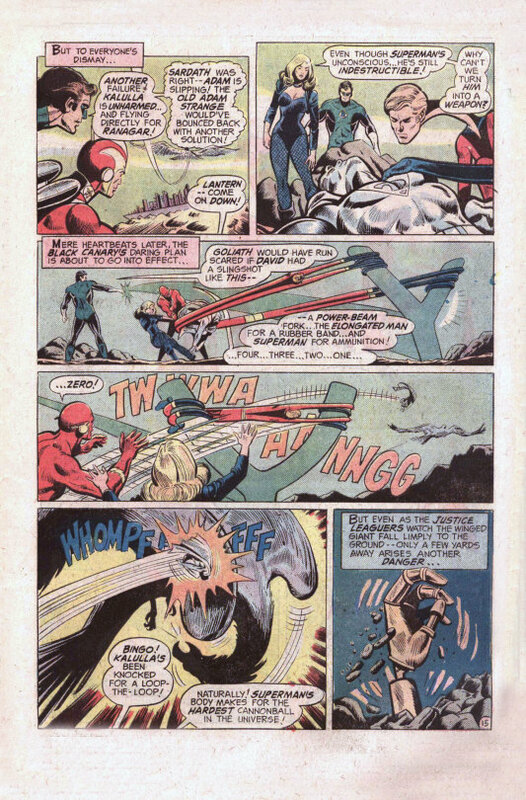 The issue opens with the Justice League, having defeated some mad scientist, stumbling across a cave painting of Adam Strange being Zeta-Beamed away to Rann. 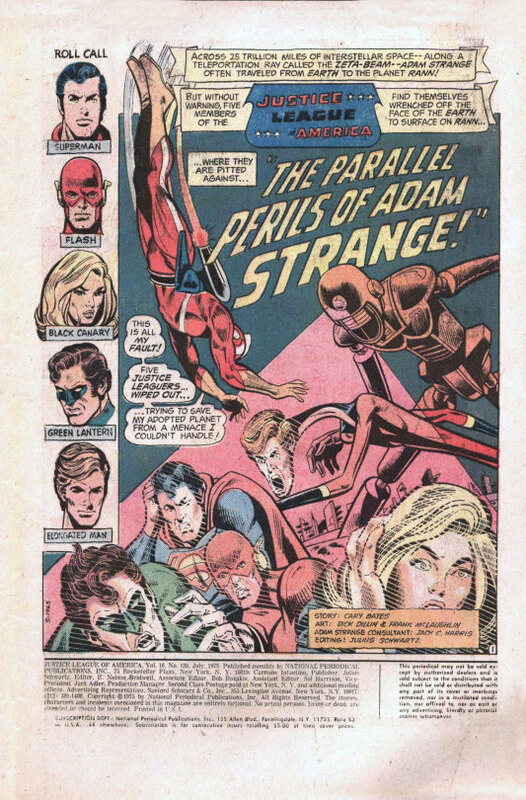 This leads the League to recap Adam’s history for Black Canary, despite teh fact that she had been around for the JLA’s previous most recent adventure with him–oops! Either way, she and the readers get a crash course–and then, suddenly, one by one the Leaguers find themselves Zeta-Beamed to far-off Rann themselves. The League heads to the capital city of Ranagar to get some answers, but before they arrive, they’re attacked by a colossal raygun floating in midair. 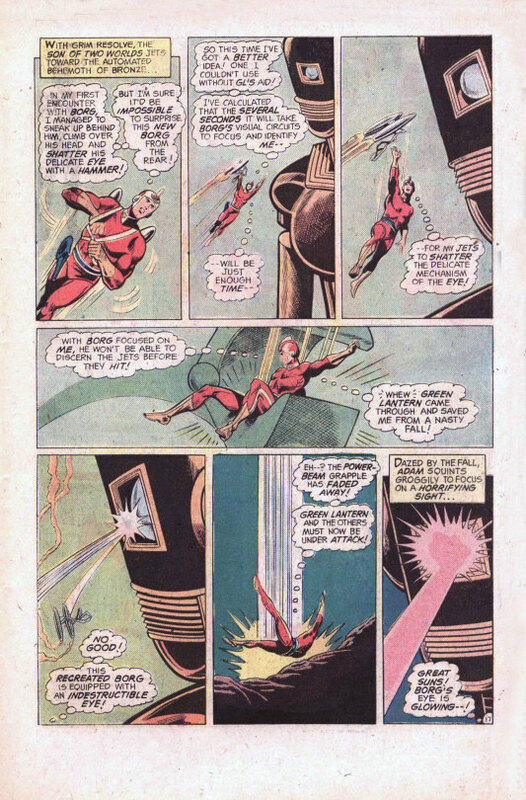 Adam Strange appears to help contain the menace, one he’s fought before, but the solution he used in the past proves ineffective. 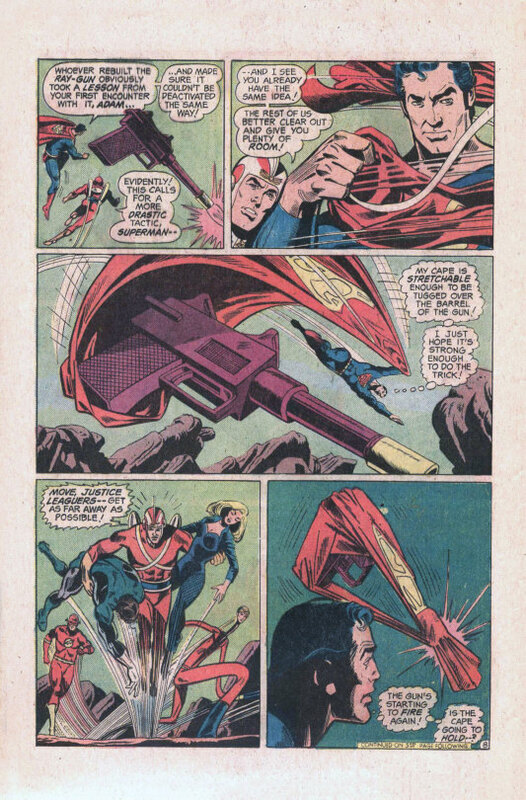 It falls to Superman to use his indestructible cape to block up the muggle of the raygun, destroying it when next it attempts to fire. In a literal post-mortum, the JLA learns from Adam and Sardath, the scientist father of his lover Alanna, that Rann is being plagued by menaces from the past, and that Alanna was killed by one of these menaces, causing Adam’s resolve to waver in his grief. They also learn that some unseen hand used Sardath’s Zeta-Plus Beam device to bring the League to Rann. That someone turns out to be their mutual old foe Kanjar Ro, who is behind all of this, seeking revenge on both Adam and the League. More old menaces are sent against Ranagar, and the League accompanied by Adam, move out to defend the city. After repeated failures against his old foes, Adam hurls himself against the giant robot Borg, hoping to be able to overcome him as he had in years past. But no dice–and in the next instant, Borg unleashes a disintegration beam that atomizes the Justice League, leaving only their empty costumes behind. 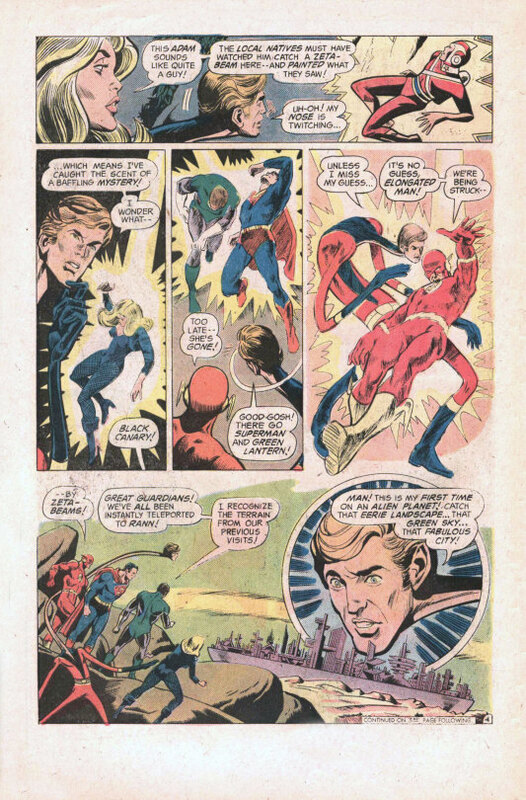 Somehow, Adam must have turned back Borg off-camera, because the next thing we know, Adam is with Sardath, preparing to Zeta-Plus Beam himself back to the JLA Satellite to let the rest of the League know about the deaths of their fellow members. And Kanjar Ro delights in the opportunity to destroy the other half of the League as well. To Be Continued…but in a comic I had already read! 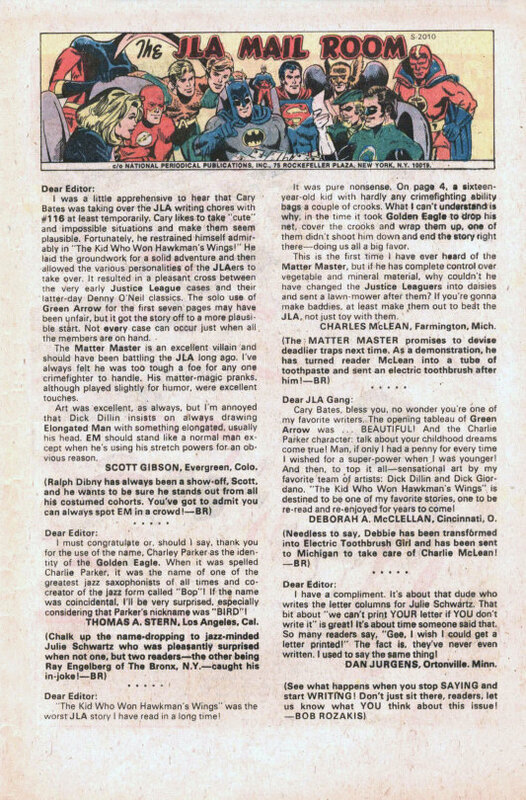 One other noteworthy bit of business in this issue: the JLA MAIL ROOM letters page included a note from a young Dan Jurgens, who in a few years would go on to both write and draw for DC, and who would himself be instrumental in killing Superman.